Thanks for praying the Novena to St. Clare with us. 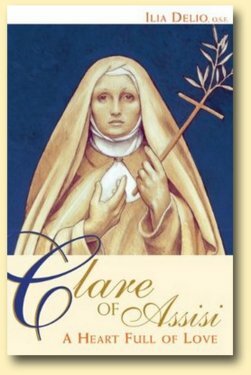 We have provided additional resources about St. Clare we thought you might enjoy. Happy Feast of St. Clare! May God place you among the saints. 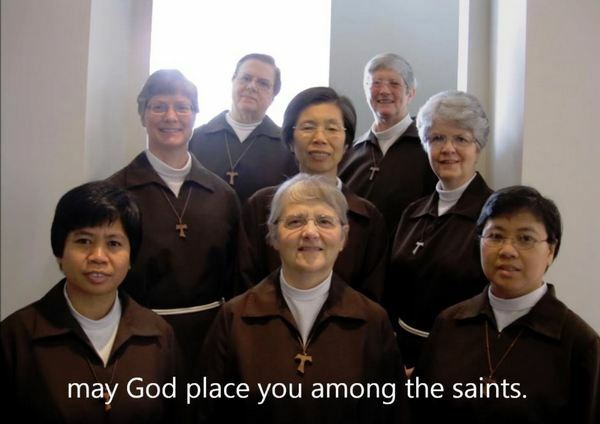 The Poor Clares in Cincinnati sing, The Blessing of St. Clare. Clare was not simply a follower of Francis, she was a formidable, resolute, devout and loving saint whose life centered on this essence of human identity. Christ is in each of us and she sought to teach us to just be ourselves and to let God dwell within us. As a special treat, our friends at Franciscan Media have allowed us to share with you an article that appeared in their August issue of the St Anthony Messenger Magazine, Radical Saint, Radical Faith: Clare of Assisi. Author Ilia Delio, OSF, shows us just how Clare's simple, but powerful beliefs transformed the way we all think about Christ even today. This article is adapted from her book, Clare of Assisi, A Heart Full of Love, by Franciscan Media. "St. Clare is a great inspiration for me,"
The official name of the “Poor Clares” is the “Order of St. Clare” (“OSC”). They are the contemplative branch of the Franciscan Family founded by St. Clare in 1212. Their Mission is to pray for the needs of the church, the world, and all people. The Poor Clares of the Franciscan Monastery of Cincinnati share their Vision Statement which is the particular way they feel they are to called to live the Poor Clare life in the 21st century. As followers of Clare and Francis, this is what we ardently seek and long for: To live as a loving community the Gospel of Our Lord Jesus Christ in poverty, littleness, simplicity and joy; open and sensitive to the Spirit working within us, among us, and beyond us; lovingly surrendering ourselves to the Lord; witnessing to the primacy of contemplative prayer and trusting in the care of the Lord each day of our lives. Pray the Novena to St. Clare.